In 2012, the state Department of Education released the latest New England Common Assessment Program (NECAP) scores, and the state averages for “proficient” or above scores had advanced to 79 percent of eleventh graders in reading. The state had been giving the NECAP — reading and math tests for grades three through eight and eleven — since 2005. But in seven years, the results for poor black and Hispanic children, and those with learning and other disabilities, were still dismal. As the state prepared to use them as a 2014 graduation requirement, some sounded the alarm about the long-term disparities that would ensue for at-risk kids who wouldn’t pass the test. “The latest statistics should serve as a wake-up call to all parents and policymakers,” warned Rhode Island ACLU Executive Director Steven Brown. Three years later, the state had replaced the NECAP with the Partnership for Assessment of Readiness for College and Careers (PARCC), a high-stakes test companion to the Common Core, a tough new set of English and math standards. Rhode Island’s first PARCC scores dropped through the floor of NECAP results: Only a third of students met the English standard and only a quarter met the math standard. 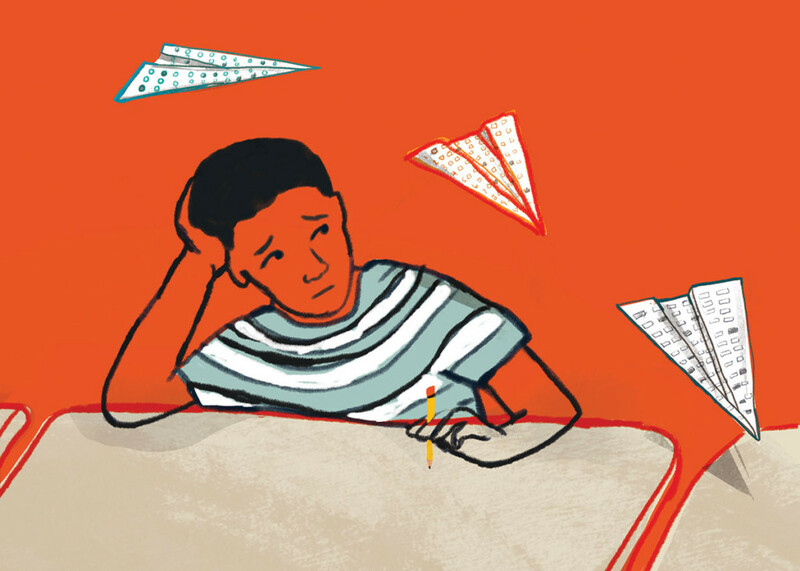 In 2017, the state abandoned the PARCC and turned to the standardized test next door. The Rhode Island Common Assessment System, modelled on the Massachusetts version but still aligned to the Common Core curriculum, also measured math and English proficiency in grades three through eight. In December, the state learned that changing the test did not the change the results: 34 percent tested as proficient in English; 27 percent were proficient in math; a fifth met no expectations in either subject. The state’s students performed as well as the lowest 10 percent of districts over the border. Five years, three different standardized tests. Education reform fever is again sweeping the political class. The GOP blamed the Democrats, and the leaders of the state House and Senate moved better test scores to the top of their to-do lists. Some called for Education Commissioner Ken Wagner’s head. Raimondo proposed spending $10 million in the next state budget to advance her goal of universal pre-kindergarten and to leverage federal dollars to offer free breakfasts and lunches for low-income students. The foundation, which targets educational success as one of its key initiatives, convenes twenty-five education, political and business leaders for monthly meetings with two goals: identifying a long-term vision for kindergarten through grade twelve education and the five top goals to get there. The current consensus favors consistency in hopes of replicating Massachusetts’ success. Last year marked the twenty-fifth anniversary of the Commonwealth’s Education Reform Act. Controversial and ambitious, the act established high standards, a statewide assessment — the Massachusetts Comprehensive Assessment System (MCAS) — and a system of accountability. First administered in 1998, MCAS scores were initially low, recalls David P. Driscoll, Massachusetts’ former commissioner of education, now a consultant. In 2000, about 34 percent of tenth graders failed the English and 45 percent failed the math. Last May, Massachusetts’ fourth and eighth grade students tied for first place in reading and math scores on the National Assessment of Educational Progress. And in 2018, 91 percent of tenth graders reached proficiency on the English MCAS, 78 percent on the math portion and 74 percent in science. Commissioner Wagner says the bad news is actually good news, in that it has refocused the public’s attention on education in a way that the PARCC scores did not. Instead of blaming the usual suspects, Wagner sees the stakeholders — yoked together to accept the new standards and help students meet them — bringing more coherence to curricula from district to district, ensuring instruction is properly sequenced and better preparing teachers. In January, Wagner dismissed the talk of his dismissal as “the arc of change.” His mission was to lock in a structure for improvement that his successor could continue. “We are a human capital operation. Unless we focus on students and teachers, we aren’t going to get where we want to go,” he says. Public education in America has long been molded by societal demands to equalize its citizens, form character, power the economy, establish dominance over other nations and provide a bulwark against perceived ills, such as godlessness and Communism. With tall and ever-changing work orders, the system is always ripe for a new solution. New York University educational historian and policy analyst, Diane Ravitch, has counted no fewer than twenty educational fads that have rippled the surface of public education in the twentieth century: the life adjustment movement, self-esteem of the 1980s, and the current love affair with the pull-yourself-up-by-the-bootstraps notion of “grit.” She sees the turn toward high-stakes testing introduced by the federal No Child Left Behind law as a powerful and destructive wave, pushed by billionaires like Betsy DeVos and the Koch brothers who want to privatize public education. Nonetheless, groups such as the Rhode Island State Superintendents Association (RISSA), and the state National Education Association chapter (NEARI), are onboard with a slow-but-steady intervention. But if the state wants a Massachusetts-style miracle, they say, it better pony up some Mass cash. Following the 1993 reform, the Bay State invested $2 billion over the first decade. Thomas DiPaola, executive director of the RISSA, worries about the financial inequities. Even though Rhode Island adjusted the state aid funding formula in 2010 and 2014, a large proportion of school budgets are levied locally. Rhode Island is already pushing for career education pathways for those who are not college bound and for universal pre-kindergarten. But if Rhode Island is to get it all right, it cannot stop at the Massachusetts model. The latest MCAS scores show that only a third of black and Hispanic fourth graders read at grade level — half as many as white peers. A little more than a quarter of low-income eighth graders meet the math standards — half as many as higher-income peers. The same coalition of advocates who pushed against high-stakes testing seven years ago fear the state is headed backwards. They are arguing that research shows that high school exit exams depress graduation rates without increasing achievement.